ORLANDO -- Microsoft CEO Satya Nadella said Windows has been re-architected to give it a central role in the Internet of Things. He sees the company's upcoming operating system Windows 10 as integral in managing every aspect of the IoT, from the sensors, mechanical systems, to the applications and analytics that underlie it. Appearing at Gartner's Symposium/ITxpo conference on Tuesday, Nadella described Windows 10 as the first step in an entirely new generation of Windows "as opposed to 'it's just another release after Windows 8.' "
Nadella, appointed Microsoft's CEO early this year, said Windows is not just about tablets, phones and PCs, but is also a platform that can "in fact run across a lot of places where general purpose compute is going to be important." The attributes of Windows, its management and security, "are going to be more of a premium going forward," Nadella said, such as when users are considering how to keep things like an HVAC system from getting hacked. This was Nadella's first time at the Symposium/ITxpo conference, which has an overall attendance of 8,500, including about 3,000 CIOs, according to Gartner. His appearance on stage began with a preamble in the form of a series of taped questions by attendees. When a question about licensing was asked – "When will you make your licensing agreements simpler and easier to understand?" – the audience cheered and applauded. When the opportunity arose to address licensing during his 45-minute appearance, Nadella explained the problem. Some of the licensing complexity was the result of trying to meet the "infinite flexibility" required by customers, but if a one-size-fits all licensing model replaces it, "there will be a different kind of backlash," he said. 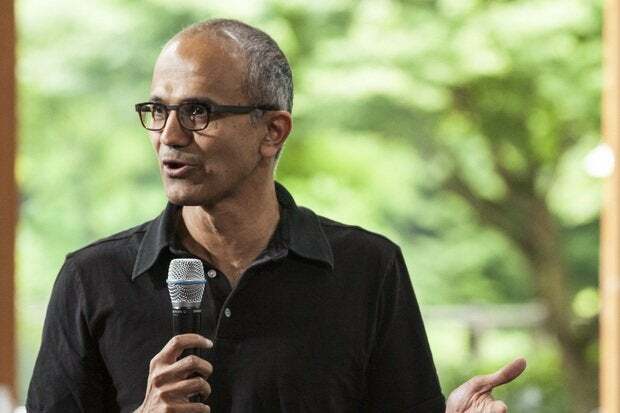 "There is no question in my mind that we have to listen to the feedback and figure out how we get to a place where we make progress on licensing," Nadella said. He also told the audience "that we won't exist if we don't serve you well." It was also a chance for the audience to get a measure of Nadella and to compare him with former CEO Steve Ballmer, who appeared in this forum many times. Ballmer would probably have answered that question with his typical boisterous and humorous style. Nadella, crisply and rapidly, said this about the unpopular Windows 9: "It came and went." The line was delivered with enough finality and humor to get the audience to chuckle. It also avoided turning the issue into a spectacle of follow-up questions from Gartner analysts Drue Reeves and Merv Adrian. Clearly, Nadella was selling Windows 10 at this forum, especially to attendees such as Phil Elliott, director of application development at the University of Chicago Booth School of Business. The school remains on Windows 7. Any decisions about Windows 10 won't be made quickly, Elliott said. "We will let the dust settle on that a little bit and see what the jury has to say." Nadella is a Booth alum, and Elliott, acknowledging his favoritism for Nadella because of it, described him as "an impressive speaker, and he's able to laugh at himself." Frank Elmore, the CIO of Orange County Public Schools in Florida, said Ballmer's personality sometimes got in the way of Microsoft's message, but Nadella talked about Microsoft in a "succinct and resonating way."